Got questions about what it’s like to be an Eco-Rep? Are you an Eco-Rep that may be stuck on planning an event? Not sure what to do next? If you’re looking for answers, you’ve come to the right place! I have assembled several questions I, or other people have asked about Eco-Reps and I’m here to answer them for you. Q: So what is Eco-Reps? What’s the point of the program? A: Eco-Reps is a volunteer leadership peer education program for sustainability. The overarching goal of the program is help Dickinsonians gain a better understanding of sustainability and how to connect these opportunities to their lives.
. We represent a number of diverse spaces on campus and we’re still trying to expand. Volunteers engage their communities in a number of ways to educate on sustainable practices. Q: What are the responsibilities of an Eco-Rep? A: Eco-Reps don’t have a lot of “required” responsibilities, as it is a volunteer leadership position. Eco-Reps must turn in a place audit every two weeks for their communities and they should attend 3 mandatory meetings per semester and make an effort to attend Sustain IT workshops to further their own sustainability education. Eco-Reps also must host one event or campaign per semester and they can work together with each other and RAs. For more information, check out the responsibilities page for Eco-Reps and take a look at the 2016-17 Eco-Reps Manual. Q: Why do Eco-Reps have to do audits? A: The place audits are collected and digitized by the Eco-Reps Coordinator (me) in an Excel spreadsheet and some of that data is used to compare waste habits of various buildings from year to year. However, the audits are mainly for the Coordinator to follow what is happening for the spaces being represented and see whether Eco-Reps are fulfilling their responsibilities. The audits are also to help Eco-Reps think more critically about their place and what they can do to improve different aspects of it. Q: What characteristics does a good event have? A: The purpose of the events is to put an Eco-Rep in a more visible position within the community. It allows them to engage directly with the people they represent and educate them about what Eco-Reps do and what non-Eco-Reps can do. A good event is planned far in advance and advertised effectively. Many residence hall Eco-Reps will team up with their RAs to expand their budget and potentially attract more people to the event. Ideas for events can often be difficult to come up with, but there is a list of sample ideas in the manual at the above link. Q: Who can be an Eco-Rep? A: Anyone! No, really. This semester we have Eco-Reps in nearly every residence hall and we have student Eco-Reps representing clubs and sports teams. We also have some faculty and staff Eco-Reps as well. Anyone at Dickinson can choose to be an Eco-Rep in almost any space. Spend a lot of time in Rector? Think of becoming an Eco-Rep for the building! We would love to get more clubs and centers on campus involved in the program. If you’re interested in applying for the Spring semester, check out the application online at www.dickinson.edu/ecoreps and email me with any questions at brangwya@dickinson.edu. This entry was posted in Uncategorized and tagged 2016, CSE, Dickinson, Dickinson College Center for Sustainability Education, Eco-Reps, Q&A, sustainability on October 27, 2016 by brangwya. This past Sunday our new Eco-Reps for the Fall 2016 semester got together for their training day. Check out this roster for their information! This entry was posted in Uncategorized and tagged Dickinson College Center for Sustainability Education, Eco-Rep events, Eco-Reps on September 5, 2016 by larsonso. We are currently searching for Eco-Reps for the upcoming academic year! Returning and first-year students are welcome to apply. This position provides an excellent introduction into sustainability at Dickinson for first-year students and can help returning students become more involved. The Eco-Reps Program coordinates students to serve as peer educators for sustainability in each residence hall. These students work to promote sustainable behaviors among residents, increase knowledge about sustainability, and provide a connection between the Center for Sustainability Education and Dickinson’s residential life experience. Eco-Reps ideally serve a one-year term and are assigned a residence hall, which they will monitor. Eco-Rep duties include monitoring the recycling bins, emptying the compost, creating bulletin boards and other educational material about sustainability within their residence hall, hosting at least one event per semester to promote living sustainably, and attending bi-weekly Eco-Reps meetings. HOURS: Successful Eco-Reps usually serve an average of three hours per week during the semester. Bi-weekly meetings are required. COMPENSATION: This is a volunteer leadership experience. QUALIFICATIONS: Strong candidates should be passionate about the concept and execution of sustainability on campus. No previous experience with sustainability at Dickinson is required. To apply, fill out the form below and send it to sustainability@dickinson.edu. This entry was posted in Eco-Rep Updates and tagged apply, composting, Dickinson College Center for Sustainability Education, Eco-Reps, education, events, internship, leadership, recycling, sustainability on July 1, 2014 by Jaime. The Eco-Reps term is coming to a close for the year. The Energy Challenge is over and so are all of our events. At this point, we are wrapping up the semester and finishing up some last minute things. One of these things is a tour of the biodiesel shop! A number of Eco-Reps expressed that they had never been before. The shop is a really cool project that I think a lot of people know we have, but don’t know anything about! So we are going to clear that up starting with the Eco-Reps.
Two of the shop interns will give us the the lowdown and show us what they do! I have been to the shop a few times, but even I have never gotten a full tour before so this is very exciting. We have invited the Athletic Eco-Reps and next year’s Eco-Reps as well! I think it will be a great way to end the semester. Then all that’s left is our end of year party! ahhh It’s crazy to think how the time flies. This entry was posted in Uncategorized and tagged dickinson college biodiesel, Dickinson College Center for Sustainability Education, Eco-Reps, tours, wrapping up on April 17, 2014 by Christine Burns. The Eco-Reps have been cruising on their events over the past few weeks. They have all been Energy Challenge related and we have had some serious successes. The Adams event had over 60 people and the Drayer event had over 50! The Eco-Reps have gotten super creative. One event involved making icecream by hand and another involved using the energy free- bike blender to make a smoothie! Thanks for doing such a great job guys! In addition, the Energy Challenge winners will be announced at Relay for Life on Friday!! Get pumped. Check out the photos page for pics from our events. This entry was posted in Eco-Rep Reflections and tagged Adams Hall, bike blenders, Dickinson College Center for Sustainability Education, Drayer Hall, Eco-Reps, Energy Challenge, icecream, smoothie on April 8, 2014 by Christine Burns. The Federal Energy Regulatory Commission recently approved a pilot tidal project in Puget Sound, Washington. Tidal power harnesses the power produced in the regular tidal periods with turbines sitting in the water and turning as the tide comes in or goes out. The turbines then run generators that produce electricity. Only two turbines would be installed in this pilot project, which is investigating the viability of tidal power for the Puget Sound area. This is by no means the first tidal power test area worldwide. In Maine on the Bay of Fundy, which famously has extremely large tidal ranges (50 feet or more! ), turbines are being installed to provide a clean source of energy for the Town of Lubec and the City of Eastport. These tidal projects in the United States follow other tidal projects in European countries like Ireland. There are potential drawbacks for tidal power, however. Many are afraid that the turbines will interfere with the migration of anadromous fish. There is also the fear that tidal ranges will be altered in some way, as well as the issue surrounding the depletion of fresh water access to the ocean, altering the salinity in the estuary. When it all comes down to it, there are pros and cons to tidal energy just like there are for every other type of energy. There is no such thing as a free lunch and we’re going to have to pick and choose what we’re willing to sacrifice in order to provide energy for our ever-increasing demand. This entry was posted in Eco-Rep Reflections and tagged Dickinson College Center for Sustainability Education, Maine, pilot projects, puget sound, renewable energy, tidal energy on April 1, 2014 by Christine Burns. We are in the middle of the second week of the Energy Challenge and the results are out! Congratulations to McKenny and Conway for taking an early and substantial lead!! You guys are doing a great job! Everyone else: You still have time to catch up and win the $200 prize! Other prizes you can win….Change your profile picture to match the CSE one, and tag yourself in it for a chance to win $25 gift certificate. This challenge only works if we all take it on. We have a chance to reduce our impact on the earth and we should take it. If you are interested in the real time standings of your dorm check out the Lucid Dashboard. We want to hear that your committed! Join us for the second half of the challenge! This weekend we will be hosting a bonfire for Earth hour out on Morgan field! The a cappella groups will be there, the Peddler will be there, and we will have s’mores and good campfire fun! Looking forward to seeing everyone on Saturday from 8:00-9:30! This entry was posted in Eco-Rep Events and tagged #dsonempowerment, bonfire, Dickinson College Center for Sustainability Education, earth hour, Energy Challenge, profile pic, standings on March 27, 2014 by Christine Burns. CSE has put out applications to join the Eco-Reps for the Fall 2014 school year! If you passionate about about working with others or about sustainability then considering joining the Eco-Reps team! We are a group of enthusiastic Dickinson students working hard to peer educate and inform students living in the residence halls about how to live more sustainably. You will meet new people and develop leadership skills which are a great networking tool as well as an awesome addition to your resume! You would be in charge of attending bi-weekly meetings, maintaining residence hall compost, hosting sustainability- related programming, and acting as liaison between the residents and CSE. Training is provided, so no experience necessary! Check us out online to find out more about CSE student opportunities. To apply, submit your application and a copy of your resume to sustainability@dickinson.edu by 5:00 pm on April 7th. This entry was posted in Eco-Rep Updates and tagged apply now, composting, Dickinson College Center for Sustainability Education, Eco-Reps, events, internship, sustainability on March 18, 2014 by Christine Burns. The article in the New York Times, “Rain in California Brings Relief, and New Problems,” from February 28th, describes the benefits and problems associated with the recent rain in California. If you have read the blog post from about a month ago, you may be aware that California has been experiencing a terrible drought. Meteorologists are describing California’s drought as the worst drought the state has experienced in over 100 years. Fortunately, in late February, California received some much needed rain. Meteorologists predicted as much as 10 inches of rain in some parts of the state. The rain is a good occurrence, however, the amount is not nearly enough to make up for the amount lost. California needs approximately 20x the amount of rain they have just received in order to replenish water levels. While the rain is a much needed resource for California, it is also causing many problems throughout the state. Because the soil is extremely dry, it is less able to absorb water. This reduced ability to absorb water has caused flash floods throughout California. In addition to the flash floods, many areas are experiencing mud slides due to the lack of water and vegetation as a result of drought and forest fires. I think that an important thing to keep in mind is that relief from one problem such as drought can also add problems in other environmental areas. Due to the severely dry soil, the solution to the problem is much more complicated. This rain gives the state hope, but it will be a long and complex journey to recovery. This entry was posted in Eco-Rep Reflections and tagged Annie Dyroff, California drought, Dickinson College Center for Sustainability Education, drought, Eco-Reps, environmental stress, mud, New York Times on March 6, 2014 by Christine Burns. 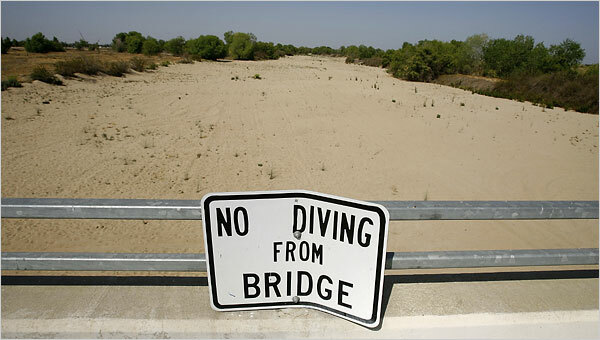 Today I was reading an article in the New York times about the severe drought that California is experiencing. This three year drought is, “on track to be the worst drought in 500 years.” Forty-thousand people living in rural communities are in danger of running out of water within the next 60 to 120 days. The state is putting in emergency measures and are getting prepared to truck in water. The scariest part is that this is the rainy season in California. This drought is forcing the citizens of California to think about their water consumption in ways we don’t typically need to in the United States. They are being forced to take short showers where they turn the water off while they lather up. They can’t water their gardens, their lawns, or their cars. Even recreational past times like camping and fishing are being temporarily outlawed throughout the state to protect the salmon populations and prevent forest fires. In a country where we are very used to being able to get what we want when we want it, this is quite a wake up call. I am glad to see that the state is hosting drought survival sessions to equip people with the tools they need to help each other get through this drought because everyone must conserve water in order for there to be enough water for everyone. I think people might finally begin to see how climate change relates to them. In the United States we are removed from the land. Most of us go to the supermarket and buy our meat nicely wrapped in a plastic case and a fruits and veggies are in a big bin with a whole bunch more. It’s hard to see where that food came from and the struggles that the person who grew it may have gone through. We don’t really see a food crisis because we can always import it in bulk from another country but for the people of California, this drought is undeniable. People can’t look the other way because they can see it drying up before the eyes. Drought dries up rivers in California. The farmers especially, are in a very sticky spot. They need water to grow their crops, and without water how can they do so? There are drought resistant crops, but nothing can withstand the current conditions in some areas of California. In addition, the cultivation of medical marijuana has become popular in the state because it is one of the few areas where it is legal to do so, but marijuana is a very water intensive crop and it is putting a serious strain on the salmon population. This article call all of our attention to the growing issues surrounding climate change. It is our responsibility to take a long hard look at how we might be able to reduce our footprint. If everyone made a commitment to take a shorter shower or carpool to work, think of the water we could conserve or the emissions we could prevent. This entry was posted in Eco-Rep Reflections, Uncategorized and tagged california, Christine Burns, CSE, Dickinson College, Dickinson College Center for Sustainability Education, drought, farmers, medical marijuana, NY Times, salmon population, water scarcity on February 4, 2014 by Christine Burns.